There cannot be a language more universal and more simple, more free from errors and from obscurities, that is to say more worthy to express the invariable relations of natural things. . . . [Mathematics] seems to be a faculty of the human mind destined to supplement the shortness of life and the imperfection of the senses. wheat that he craved. So, secretly marveling at the humility and restraint of his counselor, the King consented. When, however, the Master of the Royal Granary began to count out the grains, the King faced an unpleasant surprise. The number of grains starts out small enough: 1, 2, 4, 8, 16, 32, 64, 128, 256, 512, 1024 ... but by the time the 64th square is approached, the number of grains becomes colossal, staggering. In fact, the number is (see box on page 24) nearly 18.5 quintil-lion. Perhaps the Grand Vizier was on a high-fiber diet. How much does 18.5 quintillion grains of wheat weigh? If each grain is a millimeter in size, then all of the grains together would weigh around 75 billion metric tons, which far exceeds what could have been stored in the Shah's granaries. In fact, this is the equivalent of about 150 years of the world's present wheat production. An account of what happened next has not come down to us. Whether the King, in default, blaming himself for inattentiveness in his study of arithmetic, handed the kingdom over to the Vizier, or whether the latter experienced the tribulations of a new game called viziermat, we are not privileged to know. The story of the Persian Chessboard may be just a fable. But the ancient Persians and Indians were brilliant pathfinders in mathematics, and understood the enormous numbers that result when you keep on doubling. Had chess been invented with 100 (10 X 10) squares instead of 64 (8x8), the resulting debt in grains of wheat would have weighed as much as the Earth. A sequence of numbers like this, where each number is a fixed multiple of the previous one, is called a geometric progression, and the process is called an exponential increase. Exponentials show up in all sorts of important areas, unfamiliar and familiar—for example, compound interest. If, say, an ancestor of yours put $10 in the bank for you 200 years ago, i 6 • Billions and Billions or soon after the American Revolution, and it accrued a steady 5 percent annual interest, then by now it would be worth $10 X (1.05)200, or $172,925.81. But few ancestors are so solicitous about the fortunes of their remote descendants, and $10 was a lot of money in those days. [(1.05)200 simply means 1.05 times itself 200 times.] If that ancestor could have gotten a 6 percent rate, you'd now have over a million dollars; at 7 percent, over $7.5 million; and at an extortionate 10 percent, a tidy $1.9 billion. Likewise for inflation. If the rate is 5 percent a year, a dollar is worth $0.95 after one year, (0.95)2 = $0.91 after two years; $0.61 after ten years; $0.37 after twenty; and so on. This is a very practical matter for retirees whose pensions provide a fixed number of dollars per year with no adjustment for inflation. The most common circumstance in which repeated doublings, and therefore exponential growth, occurs is in biological reproduction. Consider first the simple case of a bacterium that reproduces by dividing itself in two. After a while, each of the two daughter bacteria divides as well. As long as there's enough food and no poisons in the environment, the bacterial colony will grow exponentially. Under very favorable circumstances, there can be a doubling every 15 minutes or so. That means 4 doublings an hour and 96 doublings a day. Although a bacterium weighs only about a trillionth of a gram, its descendants, after a day of wild asexual abandon, will collectively weigh as much as a mountain; in a little over a day and a half as much as the Earth; in two days more than the Sun. . . . And before very long, everything in the Universe will be made of bacteria. This is not a very happy prospect, and fortunately it never happens. Why not? Because exponential growth of this sort always bumps into some natural obstacle. The bugs run out of food, or they poison each other, or are shy about reproducing when they have hardly any privacy. Exponentials can't go on forever, because they will gobble up everything. Long before then they encounter some impediment. 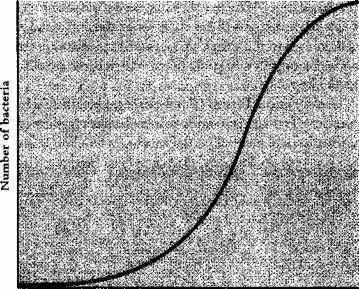 The exponential curve flattens out. 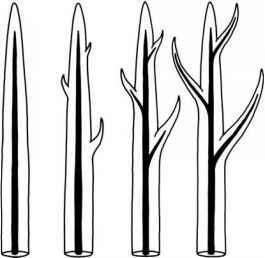 (See illustration.) This is a distinction very important for the AIDS epidemic. Right now, in many countries the number of people with AIDS symptoms is growing exponentially. The doubling time is around one year. That is, every year there are twice as many AIDS cases as there were in the previous year. AIDS has already taken a disastrous toll among us. If it were to continue exponentially, it would be an unprecedented catastrophe. In 10 years there would be a thousand times more AIDS cases, and in 20 years, a million times more. But a million times the number of people who have already contracted AIDS is much more than the number of people on Earth. If there were no natural impediments to the continued doubling of AIDS every year and the disease were invariably fatal (and no cure found), then everyone on Earth would die from AIDS, and soon. Exponentials are also the central idea behind the world population crisis. For most of the time humans have beef on Earth the population was stable, with births and deaths almost perfectly in balance. This is called a "steady state." After the invention of agriculture—including the planting and harvesting of those grains of wheat the Grand Vizier was hankering for—the human population of this planet began increasing, entering an exponential phase, which is very far from a steady state. Right now the doubling time of the world population is about 40 years. Every 40 years there will be twice as many of us. As the English clergyman Thomas Malthus pointed out in 1798, a population increasing exponentially—Malthus described it as a geometrical progression—will outstrip any conceivable increase in food supply. No Green Revolution, no hydroponics, no making the deserts bloom can beat an exponential population growth. There is also no extraterrestrial solution to this problem. Right now there are something like 240,000 more humans being born than dying every day. We are very far from being able to ship 240,000 people into space every day. No settlements in Earth orbit or on the Moon or on other planets can put a perceptible dent in the population explosion. Even if it were possible to ship everybody on Earth off to planets of distant stars on ships that travel faster than light, almost nothing would be changed—all the habitable planets in the Milky Way galaxy would be full up in a millennium or so. Unless we slow our rate of reproduction. Never underestimate an exponential. The Earth's population, as it has grown through time, is shown in the following figure. We are clearly in (or just about to emerge from) a phase of steep exponential growth. But many countries—the United States, Russia, and China, for example—have reached or will soon reach a situation where their population growth has ceased, where they arrive at something close to a steady state. This is also called zero population growth (ZPG). Still, because exponentials are so powerful, if even a small fraction of the human community continues for some time to reproduce exponentially the situation is essentially the same—the world population increases exponentially, even if many nations are at ZPG. There is a well-documented worldwide correlation between poverty and high birthrates. 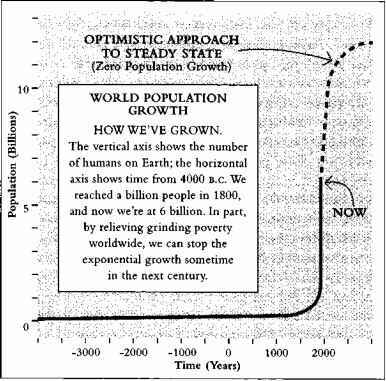 In little countries and big countries, capitalist countries and communist countries, Catholic countries and Moslem countries, Western countries and Eastern countries—in almost all these cases, exponential population growth slows down or stops when grirfcling poverty disappears. This is called the demographic transition. It is in the urgent long-term interest of the human species that every place on Earth achieves this demographic transition. This is why helping other countries to become self-sufficient is not only elementary human decency, but is also in the self-interest of those richer nations able to help. One of the central issues in the world population crisis is poverty. The exceptions to the demographic transition are interesting. Some nations with high per capita incomes still have high birthrates. But in them, contraceptives are sparsely available, and/or women lack any effective political power. It is not hard to understand the connection. Nuclear fission was first thought of in London in September 1933 by an emigre Hungarian physicist named Leo Szilard. He had been wondering whether human tinkering could unlock the vast energies hidden in the nucleus of the atom. He asked himself what would happen if a neutron were fired at an atomic nucleus. (Because it has no electrical charge, a neutron would not be electrically repelled by the protons in the nucleus, and would instead collide directly with the nucleus.) As he was waiting for a traffic signal to change at an intersection on South-hampton Row, it dawned on him that there might be some substance, some chemical element, which spat out two neutrons when it was hit by one. Each of those neutrons could eject more neutrons, and there suddenly appeared in Szilard's mind the vision of a nuclear chain reaction, with exponentiating numbers of neutrons produced and atoms falling to pieces left and right. That evening, in his small room in the Strand Palace Hotel, he calculated that only a few pounds of matter, if it could be made to undergo a controlled neutron chain reaction, might liberate enough energy to run a small city for a year ... or, if the energy were released suddenly, enough to destroy that city utterly. Szilard eventually emigrated to the United States, and began a systematic search through all the chemical elements to see if any produced more neutrons than collided with them. Uranium seemed a promising candidate. Szilard convinced Albert Einstein to write his famous letter to President Roosevelt urging the United States to build an atomic bomb. Szilard played a major role in the first uranium chain reaction in Chicago in 1942, which in fact led to the atomic bomb. He spent the rest of his life warning about the dangers' of the weapon he had been the first to conceive. He had found, in yet another way, the awesome power of the exponential. Don't be scared off. This is really easy. We want to calculate how many grains of wheat were on the entire Persian Chessboard.